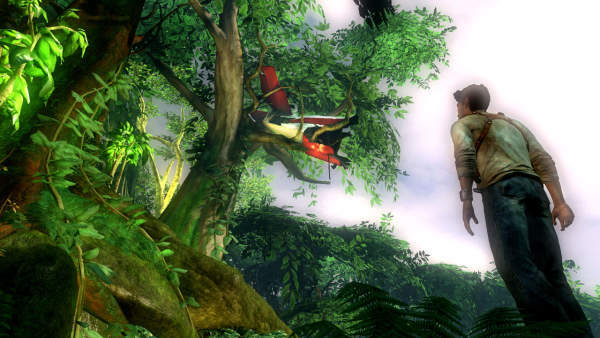 Uncharted: Drake’s Fortune is a strong candidate for the title of “most beloved exclusive in the early days of the PS3”. While this can, in part, be attributed to the lack of competition, there were also plenty of good words said about its quality. I believed them, but any number of screenshots suggested that the game hemmed close to the Tomb Raider mold of exploration and action. Not a bad comparison per se, but the best I can say about Tomb Raider: Legend and Anniversary were that they were worth playing through, though they were certainly not the best releases on any console. 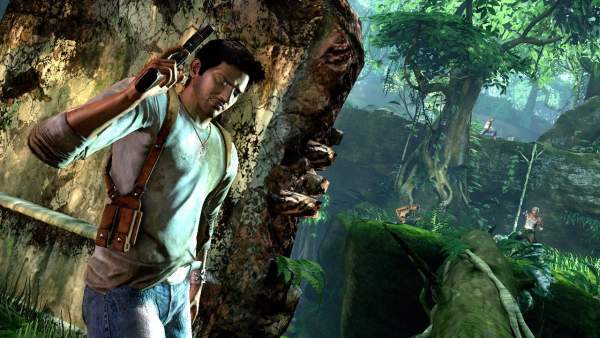 Uncharted would have to do more to earn its title. The reality of the game is that it doesn’t stray from the above description. The platforming controls are straight out of the recent Tomb Raiders, which it, in turn, learned from the modern Prince of Persia trilogy. 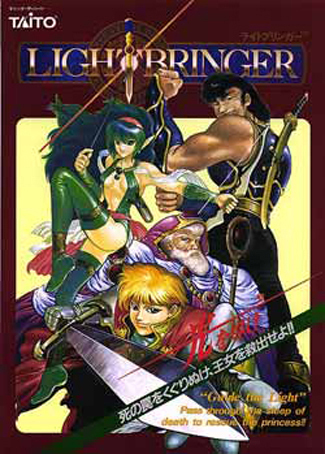 Meanwhile, the combat is a basic third person cover based system reminiscent of any number of action games. Context sensitive actions appear from time to time, though they aren’t as complex as a full fledged Quick Time Event. Uncharted’s learning curve is nonexistent for anyone with the right games under their belt (which are the same kinds of games that the target audience has likely played). But strict attention to detail and an appropriate sense of identity combine to make something that approximates the “next generation” experience I always imagined. What I am getting at is that Uncharted knows it is the gaming equivalent of adventure films like Indiana Jones or The Mummy and so it populates its cast with appropriate heroes. Sometimes they look a little a better than the average person, and crack jokes in life or death situations, but they still resemble normal human beings, and their personalities are never taken to the point where they become cliched and overbearing. Meanwhile, the villains are your generic mix of British baddies and South American mercenaries who serve as fodder for firefights and chase sequences and little else. In short, they are the perfect cast for a lighthearted, nation hopping adventure. The main villain’s ultimate purpose is a bit hackneyed, and the Nazi relics lying around are not the best way to pay tribute to Indy, but neither element lingers long enough to take momentum away from the story. Uncharted could have had a plot that waxes philosophical, or it could have lasted 15 hours instead of six. But all it wants to be is good, honest entertainment, where you can guess what will happen in the final confrontation and still smile at how it is executed. Most games these days cannot have this kind of fun without feeling guilty about it, so bravo to Naughty Dog for bucking the trend. To bring up Tomb Raider again, one aspect of the series that always bugged me was, whether due to hardware limitations or level design, the outdoor areas were often too small, while the caves and tombs were unrealistically massive. This trend continued even after moving from the Playstation, and it got to the point where the fiction was too far removed from the real world. Uncharted works hard to reverse this trend. While its ancient ruins may not resemble anything that actual archaeologists would explore, they resemble what we would expect from this kind of story. They are small and dark, forcing you to rely on your flashlight to wade through the mess. Meanwhile, the outdoor locations feature thick foliage, vistas that stretch into the horizon, and massive buildings left behind in an old Spanish colony. Every environment is packed with details that sell the setting and establish the scope of your adventure. With all the work being put into aesthetics, Naughty Dog unfortunately let the game mechanics founder. There are few platforming sections which offer a real challenge. You will rarely find yourself figuring out where to jump to next, or having to deal with a delicately timed move. That doesn’t mean that you won’t die from time to time, either thanks mistakes or confusion, but even if that happens the auto save feature is so generous that you will not be set back. I wouldn’t go so far as to say the platforming is automatic, but it is clear that the appeal is supposed to come from exploring the well rendered environments, rather than testing your reflexes. 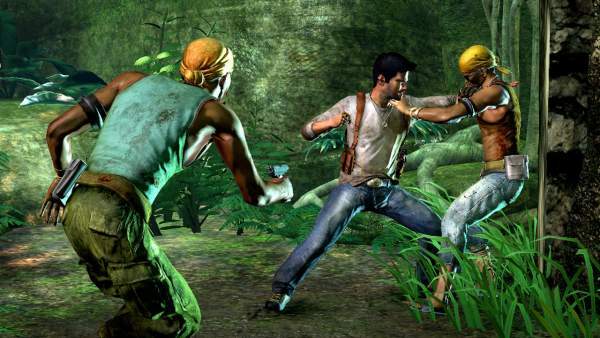 No doubt the combat is the most troubled of Uncharted’s features. To be fair, the AI is aggressive and dynamic, and enemies display a wide variety of attack animations. The problem stems from the fact that your health is extremely limited and regenerates slowly, and you can only carry a limited amount of ammo. At the same time, your foes absorb bullets like a sponge, and they attack with overwhelming numbers. If you stay in one place for too long, either you will run out of bullets, your cover will be destroyed, or you will be flushed out into the open by a well aimed grenade. If you spend too much time killing any given enemy, his comrades will seize the opportunity to flank you. The odds are stacked against you in every firefight, and they occur with far too much frequency. Even if you don’t find yourself constantly restarting, they tend to become drawn out and break the game’s pacing. It is trying to be Gears of War, which is built entirely around its combat, and allows you to carry not several dozen, but several hundred rounds, and that’s just for one of three firearms. I am not sure how a game that takes so many correct cues from the films and stories that inspire it could forget to refer to those same sources when it comes to shooting things. An important rule in mindless action flicks is that the hero can kill anyone with a quick spray of gunfire in their general direction. In the case of Uncharted, this would translate into weaker enemies, and guns that do not require pinpoint accuracy. It is already unrealistic that an adventurer like Nathan Drake is able to demolish multiple squads of trigger happy banditos and well trained mercs. Having disposable goons would hardly be a breaking point. I have said it before, and I must say it again: good developers like Naughty Dog understand that the best way to make “next gen”, or “cinematic”, or whatever the hell you are aiming for is not to have the most A-list voice actors or the biggest scripted sequences; it all comes down to the little details in the environment and character animations, carefully designed levels, and the maturity to make a story that fits the game, rather than the other way around. It is also about establishing the proper mood and tone, even if it means your game will not result in multipage plot summaries and analysis on fan forums. At the same time, Uncharted does nothing to beat out the competition in regards to its fundamental game mechanics, and it suffers for it. Not enough to make it unworthy of your time, but like so many other releases this generation, I get the feeling that its sequel will be the game it was trying to be.